She was rushed to the emergency room and had to stay for a week in the hospital. During that time, she received skin grafts and was left with permanent disabilities from the incident. Liebeck asked for $20,000 from McDonald’s, which was the cost of her medical treatment. The restaurant countered with an offer of under $1,000. Liebeck then hired a lawyer who made an offer to McDonald’s in the amount of $300,000. The issue was that the coffee was heated by the restaurant to more than 180 degrees, which was hot enough to cause severe burns within seconds. The case ended up being litigated before the court in a jury trial. Liebeck’s attorney filed a lawsuit based on a theory of negligence and of products liability. Her attorney argued that the restaurant was negligent because it heated the coffee much higher than necessary and enough to where it could cause serious injuries. The plaintiff also argued that the restaurant was liable under a theory of products liability. Product makers and suppliers owe a duty of care to consumers to keep their products safe and hazard-free when the consumers use them as intended. In the case of the coffee, Liebeck was using it as it was intended. She was not driving while she was trying to drink her coffee, and she spilled it when the car was parked and not moving. She was not warned by McDonald’s about the high temperature of the liquid. At trial, Liebeck argued that McDonald’s was negligent in heating its coffee to such a high degree that it would cause second- or third-degree burns in as little as seven seconds. She also argued that she was using the coffee in the manner that it was intended to be used and was not warned of the risks of injury. She also presented evidence that more than 700 burn cases had happened since McDonald’s started heating their coffee to a temperature ranging from 180 degrees to 190 degrees Fahrenheit. The McDonald’s operating manual actually required the coffee to be heated to that temperature range. Her lawyer presented evidence that coffee should not be served at a temperature exceeding 140 degrees and that other area restaurants served their coffee at much lower temperatures. McDonald’s admitted that it had known about the risk of burns from its coffee for a decade. 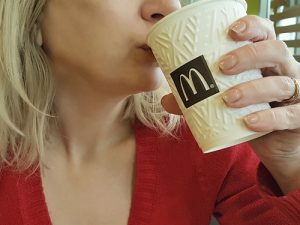 McDonald’s also admitted that its customers were not aware of the risk of burn injuries from its coffee and that it had done nothing to warn them about the risk. However, the company argued that there were so few injuries in comparison to the number of coffees it sold that it wasn’t enough of a problem for the restaurant chain to do anything about it. After both sides rested, the jury was sent with the case to deliberate. It returned a verdict of $160,000 for Liebeck’s medical expenses and $2.8 million in punitive damages that were designed to punish McDonald’s. Some of the jurors reported that the punitive damages that they awarded were because of the callous manner in which the restaurant treated the injuries and the potential for injuries. McDonald’s appealed the decision. On appeal, Liebeck’s gross award was reduced to $640,000. The case illustrates some important points. When consumers use products the way in which they are intended to be used and are seriously injured, the companies may be liable to pay damages to compensate them for their losses. Manufacturers are responsible for warning consumers of all of the potential risks of their products. When a product is inherently dangerous and the benefits of the dangers outweigh any benefits. the manufacturers are liable to pay compensation. The case also shows that when the actions of a defendant are particularly egregious in nature, juries may award punitive damages that far exceed the actual losses. Finally, the case demonstrates that if McDonald’s had simply been willing to engage in real negotiations and to settle the claim, it could have done so at a much-reduced cost as compared to what it actually was forced to pay. In the end, many people who have formed opinions about this case have done so without understanding the facts of what actually occurred.